Independent Games Festival Mobile 2008 Finalist. 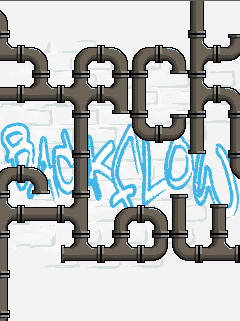 Backflow is a cross between a casual-style action game and a multiplayer strategy game for mobile phones. 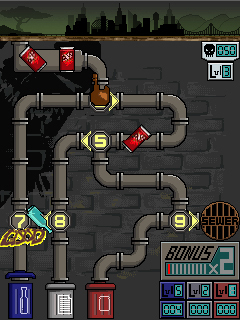 In the game you take control of the waste disposal infrastructure for a city. It's your job to make sure each type of waste goes to the right place. 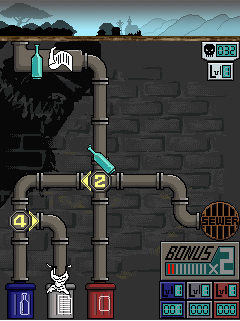 By flipping switches on pipe intersection points you direct the flow of waste to processing facilities at the bottom of the screen. Send recyclables to the right bins and they'll be converted into resources that you can use to upgrade your system, but put things in the wrong place and you'll increase the pollution in your city. 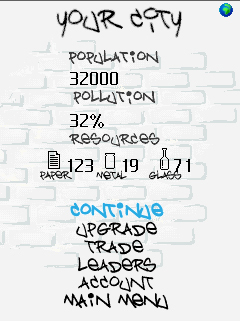 Keep pollution low and your city will grow, but if it gets out of control your citizens will leave in droves! As your city grows in population, waste comes out faster and more frequently, and upgrades become more and more important. Trade resources with other players to make sure you can keep upgrading. Try and build the biggest city you can without getting buried in the garbage! Note: to load the game into the development kit, find the folder where the Sony SDK was installed and the WTK2 folder.� First run the application "Default Device Selection" and select Sony Ericsson W900 Emu.� Then select "Run the MIDP Application" and locate the file Backflow.jad. Please download the Read Me file for complete installation instructions.